RLS is a common neurological/sleep disorder that causes uncomfortable or painful feelings, usually in a leg, but the symptoms can occur in another limb. These difficult symptoms, which include sensations of burning, tingling, crawling, pulling and tugging cause the sufferer to have an almost irresistible urge to move about in order to relieve the discomfort. PLMD (Periodic Limb Motion Disorder), often accompanies RLS. 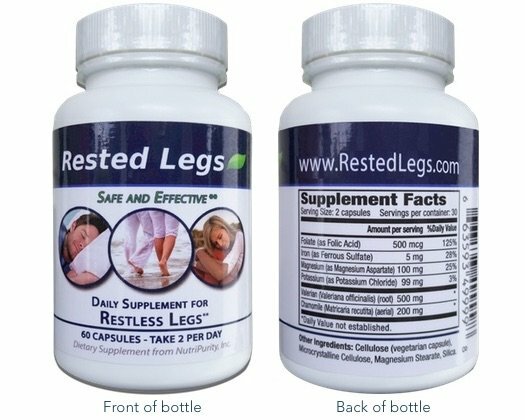 PLMF causes leg muscles to contract and jerk every 20-40 minutes during sleep. These movements may last less than a second or as long as 10 seconds. Approximately 80% of all RLS patients report PLMD. Conversely, only about a third of people with PLMD also report RLS symptoms. Osteoarthritis (degenerative joint disease). About three-quarters of patients with RLS also have osteoarthritis, a common condition affecting older adults. Varicose veins. Varicose veins occur in about 1 in 7 patients with RLS. Diabetes. People with type 2 diabetes may have higher rates of secondary RLS. Nerve pain (neuropathy) related to their diabetes cannot fully explain the higher rate of RLS. Many muscle and nerve disorders.